Craig Pullen, Head of Operations, RYF, reviews.. This new addition to the Jaguar range certainly has space and grace, but what about the pace? Jaguar: that purveyor of understated elegance and luxurious performance; responsible, under the stewardship of its founder; Sir William Lyons, for the E-Type (in my humble opinion, THE pinnacle of automotive design) was rather late to the SUV party, introducing the F-Pace in 2016. Although Jaguar and Land Rover have been linked on and off since the sixties, it’s really since TATA’s 2008 purchase of the brands from Ford that the platform sharing has been apparent, and never more so than with this F-Pace and the Discovery Sport. Externally, there’s not much to identify them as stablemates, but internally, the infotainment system, window switches and stalks are shared, and under the bonnet, it’s the same story. This is no bad thing; the West Midlands designed Ingenium engines are refined, delivering smooth performance with more torque than the predecessor. It’s not exactly quick; weighing just over two tons, it can reach 62 mph in 8.7 seconds; slower from the traffic lights as, say, a 15 plate Skoda Octavia 2.0 TDi, for example..
It’s the handling where this F-PACE really delivers; with the JLR All Wheel Drive technology delivering 90% of the power to the rear in normal driving conditions, and switching to the front when required, it’s sometimes easy to forget that one is behind the wheel of something so large, particularly when in Dynamic mode. The interior is of a particularly high quality; every surface is covered in leather or soft-touch materials, with the blue LED strips on the doors adding a sense of nightclub chic. The Jaguar’s price premium over the Discovery Sport is more understandable when compared with the latter’s more utilitarian feel. At resale time too, the F-PACE is quite compelling; this model should retain a 36 month, 60k % value in its mid to late forties; a couple of points ahead of the Germans. 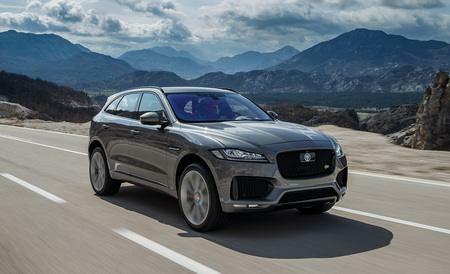 If you’re an SUV fan, this Jaguar provides a good blend of luxury, handling and styling. Grace and space is certainly present, but I suspect that Sir Bill would decry the lack of pace in this engine configuration.